I made Meegiko some dresses. The same A-line pattern from puchicollective only Lati sized. She’s wearing one of them and I’m getting the hang of the machine. Still going at a painfully slow pace but since these dresses are so small it doesn’t matter. It still gets done fast since there’s only at most a 3 inch line of fabric. I hope to tackle another kind of pattern like the empire dress. I’m squeezing these little me projects in between re-roots. Here’s my latest, a re-rooted 04NY. The customer wanted an opposite version of Dramatic bride and 04NY is the perfect doll to do that. Imagine Dramatic bride without melanin and this is what you get. She’s a nice fresh cool version. Here she wearing R&D’s Midnight Sparkle dress. Just over a year ago, I experienced the excitement of the Bonus Truck. The mystery of what I would get was too irresistible. Last year I got what the consensus considered the least favorite-04NY. I liked her though but admit that when I opened the box and saw her I was a little disappointed because I was really hoping for the more rare red head the most. The black haired girl was next on my wish list. It was still a great deal with all the goodies and I still have my plain Jane Scandinavian I call Anika. Sometimes I refer to her as Anika Underrated. This year I made out! I went through two sources to try and obtain a Bonus Truck. One was the lottery at RnD,(didn’t get picked.) The other was a wonderful dealer right in Japan that several of us Momoko addicts used to purchase the Bonus Trucks at Doll Show 21 where they were selling this year. He couldn’t promise anything but was successful and immediately sent my mystery box out. I got it yesterday and could hardly contain myself as I opened the box. I was immediately shocked and thrilled to see I got one of this year’s coveted girl, the natural redhead dead center. Right now her twin is up on Yahoo Japan at over $600.00. I’ve heard the caddy redhead is even more rare but I’m really happy to have this one. 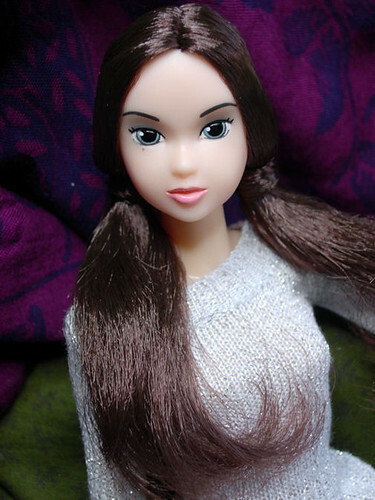 The color goes very well with her skin tone and it’s plenty different from the 05AW girls. So yesterday was definitely a Happy Doll Day! In projects, I finished another punk rocker commission. This customer wanted the reverse of Mama Told Me with mostly pink hair and black streaks. Really clever idea from the customer and I definitely love the results. I’m still amazed at the opportunity that fell in my lap the past 2 weeks. A fellow doll collector and flickr buddy has developed a new love for Petwork’s Momokos. Previously a Blythe collector, he started his search of Petworks girls and came accross my collection in my flickr photostream. I had some of his dream girls-particulary Nadiff. He had posted on several boards a want to by notice on this girl. I thought about it but wasn’t quite ready to give her up since I just got her not too long ago. But then he contacted me. So I decided to look at his collection to see if there was any girl I was looking for. I saw he had some Kenner girls so I mentioned I’d be willing to work out a trade for one of his Kenners. I thought to myself that he probably wouldn’t go for it but it turned out he was thinking of letting go of his blonde sidepart! My heart lept and I was taken aback thinking it was too good to be true. I knew I’d have to let go of more than just Nadiff in the deal. I struggled to think who else could go and finally decided on 03AN who came with Nadiff. He was looking for her also so we worked out a deal. Of course, he got some extras and some cash but thankfully it was within my reach. I had wanted a blonde Kenner and put her on my wishlist thinking it would be a while before I could afford her. So to suddenly have her and not have it be too painful as far as money and trades is really the best part. He’s got his dream girls and I got mine and we are both just ecstatic over the deal. It was hard to focus on my dolly projects during all this but I did get some done and here’s the latest commission. 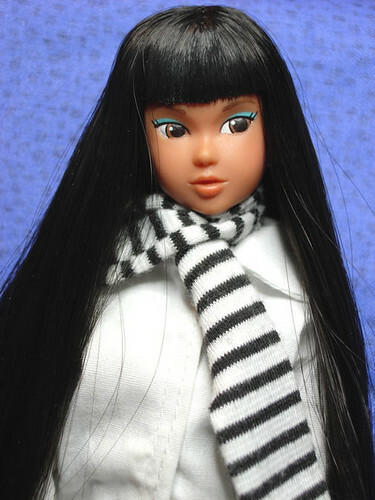 She’s a Whiter Shade of Blue Momoko re-rooted in toyokalon. The customer wanted the pin straight texture to achieve this Princess cut. I found toyokalon hard to work with but definitely will use it as an option for when I want that super straight look the the BT06 red and black girls have and my 03RD has. Follow My Back Momoko arrived yesterday and she’s very pretty and unique. She has the cutest little beauty mark below her eye. In the promo pics people complained saying it looked like a spec of paint. But when you see it in person, it looks like a freckle and fits well adding that extra touch. She’s the last doll I expect to get this year and a good one to end my ever growing collection for the year. 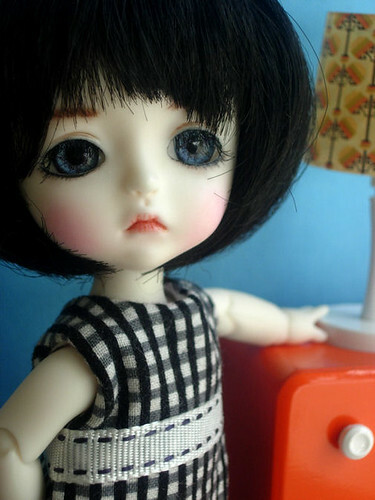 I’m going to have to consider letting some other dolls go if I’m really going to continue collecting different dolls. Most of my Sekiguchi Momokos are in the wait pile for a new look and then probably offered for sale. I’m probably not going to keep adding Blythes with a few exceptions here and there and only after I let some others go. I just don’t have the space or attention span to have hundreds of dolls. I only have 2 shelves that I can devote to my dolls. So all this is going on my New Years resolutions. Maybe I’ll have to watch some Clean Sweep episodes to inspire me not to hoard. The weather outside is… RAINY. So I’ve been getting some re-roots done. Always seems to be some that I need to do. Here’s one of them for a customer. She was previously Baby Blue Labyrinth. I got this curly hair from dollyhair.com and it sure saves me time in curling hair. She’s wearing last year’s Odd Girl Out dress. Here’s another set of my favorite doll, (well blythe is also a favorite,) and it’s sort of a technical comparison of a real BT06 next to my fake BT06. The red head is the fake. Her hair is saran and from what I understand, is a little brighter than the original. I heard that the real one has the same color hair as Victorian Nature red which I have. I’ll have to take side by side pictures of the red heads. The black haired girl who’s the real deal has different kind of hair. I’ve heard it’s called toyokalon and it’s bouncier and springier than saran. Saran has a more natural way that it falls whereas toyokalon stays stick straight. I suppose if I got really obsessed with getting the hair just right I could get some toyokalon but I love Ruby the way she is and the thought of starting over does not thrill me. I just realized it’s been at least a week since my last post. Here’s 03AN Momoko. 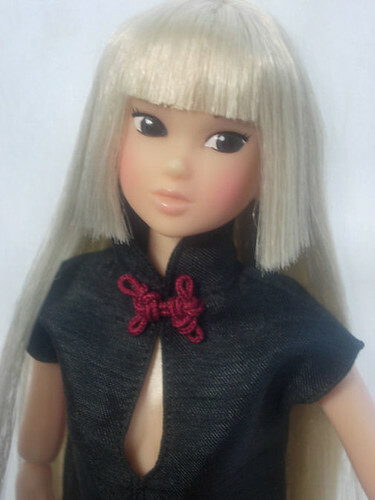 She was not on my list of wants but crept in as I saw more pictures of her and decided to make her my next Momoko. And just like that she came as a result of a trade. She looks really good in hats and can fit in them pretty well since she has little bulk in hair. On the project front I’ve been taking some personal time working on my own stuff in between commissions. I do appreciate those awaiting their dolls spa treatment patience so I can recharge my batteries. 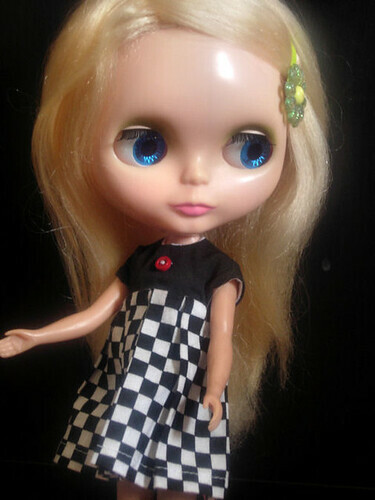 Here’s a Blythe doll that’s been a work in progress for a while. She’s previously a Tailor Gibson and has had her hair dyed several times. The problem with Tailor’s hair is the greenish cast that is almost impossible to get rid of. I kind of like this ashy color so I think she’s done. I’ll probably post her for sale on my website. But here’s her picture in the meantime. So I put a ban on getting any new dolls for the rest of the year which I was doing pretty good so far but we still have a little less than 2 months to go and the doll makers like to release some temptations right before Christmas. Somehow, I’ve ended up with 4 new dolls BUT… they were trades. I finally got the chance to get one of the highly coveted Bonus Truck girls- BT06 black. I could also get the red girl which was the one I wanted the most but I’d have to let go of my Daisy to do that and I just can’t bring myself to do it. Since I have my copy I can’t really justify it so that one will probably slip through my fingers. I am thrilled, however, to add the black version to my collection. I had to let go of 02KF but she was a somewhat neglected girl and her new owner really wanted her. I also acquired Victorian Nature Red. Said goodbye to another neglected girl Jelly Beans Momoko so hopefully she’ll be more lavished upon in her new abode. 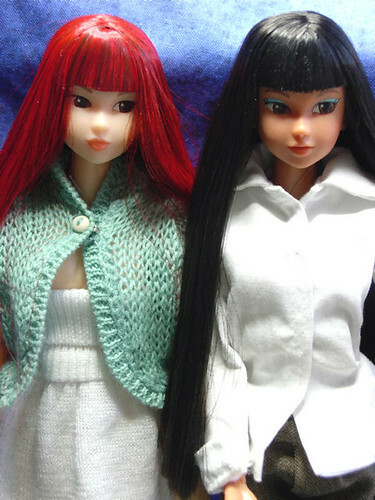 In another trade I received 03AN and Nadiff Momoko. I’ll post pics of them soon. It’s been a great week in trades! 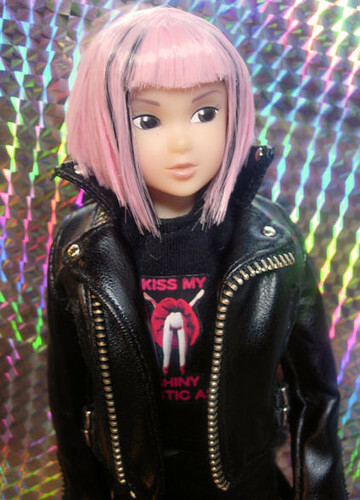 I have a new custom Momoko I did. She’s had a complete overhall. She came to me as an already customized Out with Puppy and I decided to go my own way with her so I had to remove all her paint and repainted her. 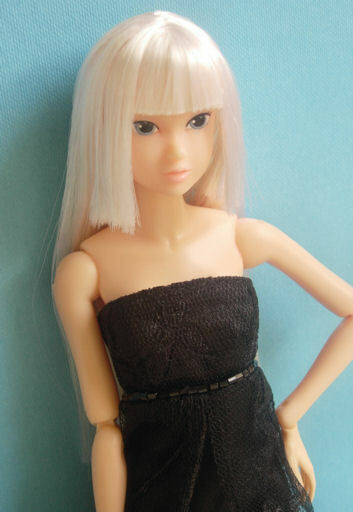 I still wanted her to have the Momoko look and tried to be as close to factory as I humanly could. She already had her hair removed by the previous owner so I re-rooted her and styled her with in a retro flip. So here she is. She is available for sale on my website.